Book Review – “Buzzing Communities” by Richard Millington. Disclaimer: This book was included as an addition to the attendee bags for the swarm conference held during September in Sydney, which I was the blogger for. I was not paid to review this book, and have decided to do so to spread knowledge about it under no reciprocal agreement. This book is subtitled “How to build Bigger, Better, and More Active Online Communities” and boy does it teach that. Having heard Rich speak at the swarm conference a few weeks ago, I was pretty excited when I finally got a chance to read this book. Since returning to Perth from Sydney, I have started a new full time position, as well as continuing my study, so “free time” is a mythical unicorn that frolics in pastures unknown to me at the moment. I tried to make a start of it on the plane home, but sleep was apparently more important as far as my brain and eyes were concerned. Rich is the founder of the company Feverbee and The Pillar Summit. They run courses for professionals teaching community managers best practices for their groups. Should I get a few moments to take a better look into it, I would like to attend one. Oh free time, you special luxury you. ahem, but I digress. This book is split up into clear sections, starting with how to manage your community, and what you need to know about your members. Within each of these sections are very straight forward chapters that describe in moderate detail the elements a community manager needs to understand in order to really get a community moving and building. There is also a good amount of information on how to properly sell the idea of building a community to higher management. Perhaps the best section, from my view point at least, is how to really measure the return on investment for your community. We sometimes gets blinded by the warm fuzzies of community building and management that we forget that there’s only really worth and value to a company if you can show, on a chart or graph, what the community is giving back to the business. Rich manages to clear away the warm fuzzies, without hurting anyone’s feelings, and get down to the nitty gritty of it all. He also does a great job of helping community managers define what success looks like. After all, if you don’t know what success looks like to you, or your management team, how are you going to know when you’ve achieved it? He also includes a couple of great appendices at the end of the book. There is one describing some great online communities to go and have a look at, as examples of the principles he describes in the book. There is also a recommended reading guide, giving the reader a chance to go and build on what has been learned in his book. I particularly like when instructional books do this because it show a degree of humility on the part of the author, or that they want the reader to get more than what they can just offer them in the book they have penned. I would recommend this book to community managers of all levels of experience, as well as marketing and PR teams who think they might like to develop a community for their brand. If both sides of the field know what is what when it comes to starting, redesigning or building a community online, then the outcomes can be much clearer and everyone knows where they stand. 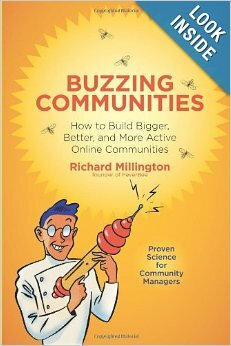 Rich Millington’s book “Buzzing Communities: How to Build Bigger, Better, and More Active Online Communities” is printed by FeverBee and can be purchased through Amazon.com in paper form or for the Kindle. This entry was posted in Book Review, Social Media and tagged book review, Buzzing Communities, community building, community manager, online community, Rich Millington, swarm. ← Why Community Managers Are Needed.